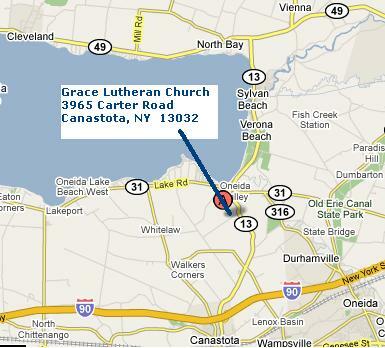 Our Church is located in Central New York between Syracuse and Utica. Sylvan Beach, located about 5 miles north of Grace Lutheran Church, is a summer resort village located on Oneida Lake. We are about 10 minutes north of the New York State Thruway at the Canastota Exit 34. The Church can be found on Carter Road at the intersection of State Route 13. Copyright © 2008 Grace Lutheran Church. All rights reserved.